Who woulda thunk that? Not me before yesterday. 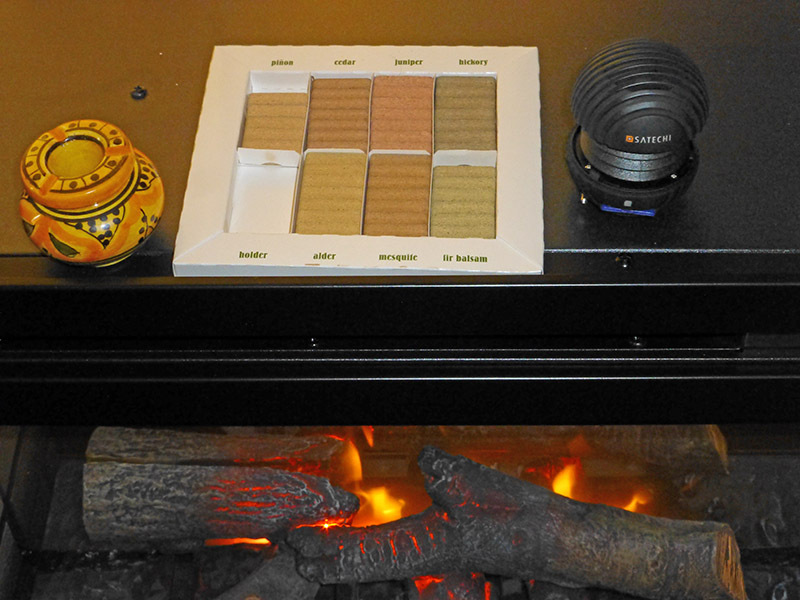 I got these accessories for the Dimplex fireplace in the mail and they’re making me grin. The item on the right is a USB-rechargeable speaker into which you can plug an SD card. Onto that card, I put a 250MB MP3 of the audio I extracted from this ten-hour YouTube video, so now I have actual and non-repeating fireplace sounds. The speaker’s been playing that MP3 for twelve hours now and it’s still going strong, so the battery time is outstanding – but I also found that you can simply leave its USB adapter plugged in all the time while it’s running. The other item is real wood incense blocks from Santa Fe. I got the sampler of seven – Piñon pine, cedar, juniper, hickory, alder, mesquite, and balsam fir – so I can decide which ones I like best and will purchase just those later. To burn the incense, I’m using a tiny novelty ashtray a friend brought me from Mexico a couple years ago. The clay holder included with the bricks is a little small – the ashes dropped off to its side when I tried the first block, which seemed a bit unsafe. I can’t wait to get the media console where the fireplace will eventually reside, but wait I must. This entry was posted in Gallimaufry and tagged Dimplex, electric fireplace, fireplace smells, fireplace sounds, virtual reality.